Last update issued on February 5, 2003 at 02:30 UTC. The geomagnetic field was unsettled to minor storm on February 4. 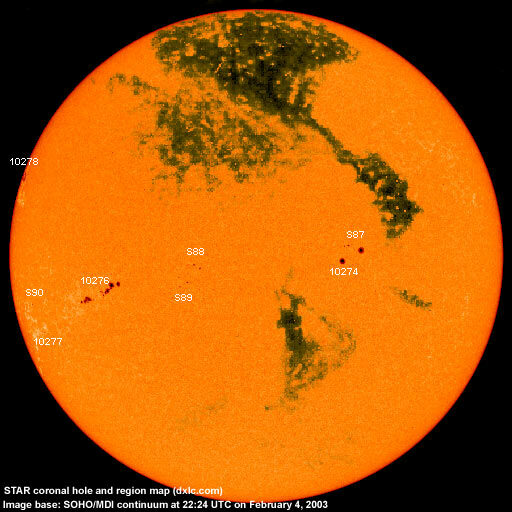 Solar wind speed ranged between 472 and 684 km/sec under the influence of a coronal stream. Solar flux measured at 20h UTC on 2.8 GHz was 134.8. The planetary A index was 24 (STAR Ap - based on the mean of three hour interval ap indices: 24.5). Three hour interval K indices: 34553333 (planetary), 34432332 (Boulder). At midnight there were 8 spotted regions on the visible disk, 4 of which have not yet been numbered by SEC/NOAA. Solar flare activity was low. A total of 2 C class events was recorded during the day. Region 10276 decayed in the trailing spot section and lost its magnetic delta structure. An M class flare is still possible. New region 10277 emerged near the southeast limb. Flare: C1.6 at 21:21 UTC. New region 10278 rotated partly into view at the northeast limb. The negative and positive polarity areas appear to be narrowly separated, but it is too early to tell if there is a magnetic delta structure present. Minor M class flares are possible. Flare: C1.4 at 20:15 UTC. [S87] A new region emerged north of region 10274 on January 31. Initially it was not clear if this was a separate region and the spots were associated with region 10274. The region developed quickly on February 2 and it became obvious that regions 10274 and S87 were separate bipolar regions. Location at midnight: S04W23. [S88] A new region emerged in the southeast quadrant on February 4. Location at midnight: S08E12. [S89] A new region emerged just southeast of region S88 on February 4. Location at midnight: S12E15. [S90] A new region emerged near the southeast limb on February 4. Location at midnight: S14E67. February 2-4: No obviously geoeffective CMEs observed. A large and well defined trans equatorial extension of the northern polar coronal hole was in a geoeffective position on February 1-3. 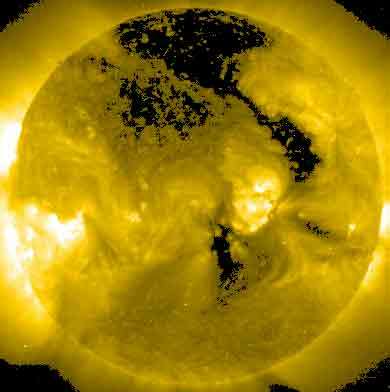 A small coronal hole in the southern hemisphere was in a geoeffective position on February 4. Processed SOHO EIT 284 image at 19:06 UTC on February 4. Any black areas on the solar disk are likely coronal holes. 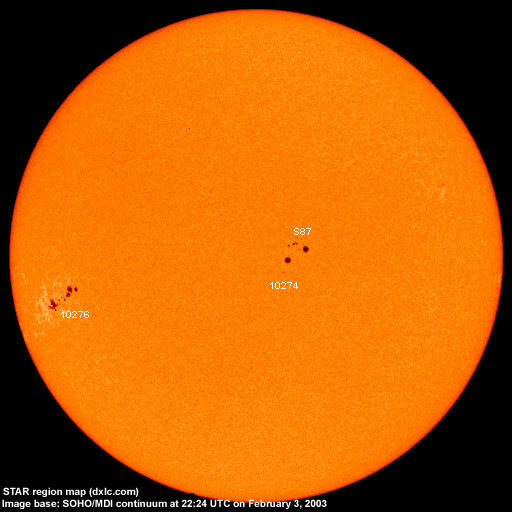 The geomagnetic field is expected to be quiet to active on February 5-7 due to a coronal stream. Long distance medium wave (AM) band propagation along east-west paths over high and upper middle latitudes is very poor, propagation along north-south paths is good.